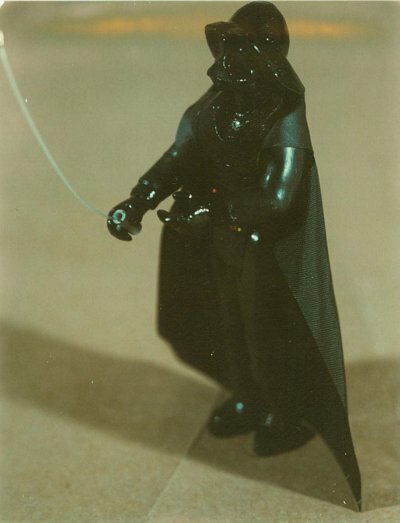 This confidential internal Kenner photo shows what is almost certainly the first three-dimensional representation of a Darth Vader action figure. This photograph, along with twelve others from this collection, is dated May 10th, 1977, a mere 15 days before A New Hope hit theaters. It is likely this figure was created shortly before that. Considering that it takes a toy company approximately 12-18 months to get a toy from concept to store shelf, we can see how truly behind Kenner was in bringing Star Wars toys to the market. This Vader was modified, or mocked-up, from a figure from the Fisher Price Adventure People-- an already existing toy line. It is interesting to see how he figure's head was resculpted into Darth Vader's helmet. It also features the initial design of the lightsaber. As Steve Sansweet notes in his Star Wars: From Concept to Screen to Collectible, Bernie Loomis, president of Kenner, "wanted Luke Skywalker's lightsaber to appear 'magically' in his hand". This is the result of that request. Although not visible in this photo, there is a small knob on Vader's back that was turned to crank out the monofilament line. As we can see, the lightsaber came out curved, and the idea was reworked. The Star Wars Collectors Archive is proud to ring in 2006 with these never-before-seen photos. Who could have imagined what these few prototype toys would eventually lead to 29 years later. Indeed, these prototypes would form the basis for many kids' childhoods, created a legion of collectors, and revolutionized the toy industry itself.